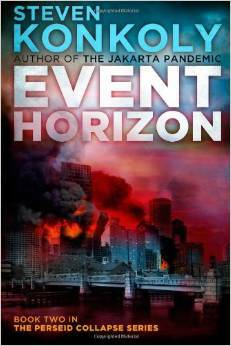 Event Horizon is the second book in the Perseid Collapse series of post apocalyptic books by Steven Konkoly. Event Horizon picks up right where the The Perseid Collapse left off as the situation in Boston is set to go to hell in a hand basket. All Alex has to do is escape Boston with two teenagers and then travel home back to Maine with the area falling into anarchy. Alex Fletcher desperately crawls through the urban jungle of Boston to save his son as well as his neighbor’s daughter. This herculean task is no small feat as the entire USA has been blacked out by a massive EMP blast. Chaos is running rampant and local militias are trying to take over various sections of the east coast including parts of Boston. Many of the militias believe that the EMP blast is a result of a government takeover and they are against any form of government, military or law enforcement presence. Alex’s actions in this book are about the rescue and the aftermath of escaping Boston with his son and friends. His return to Maine and the defense of his family and friends is an amazing story and only his military training and his abundance of luck gives them a possible chance at survival. This series is well written and entertaining to read. Point of Crisis is the third installment of the Perseid Collapse series and is next up on my reading list. This entry was posted in Book Reviews and tagged Event Horizon Book Review, Steven Konkoly, The Perseid Collapse on March 30, 2015 by GunGuy.